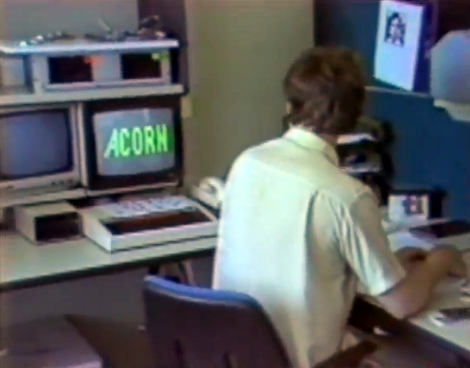 Get ready to be swept off your feet by this Acorn Risc Machine promotional video from the Mid-1980’s (also embedded after the jump). We’re sure most have put it together by now, but for those slower readers, this is the introduction of ARM processors. The video has a bit of everything. There’s a deadpan narration with just a bit of British accent around the edges. But that’s spiced up considerably by the up-beat synthesizer track playing in the background. You’ll see plenty of programmers in short-sleeve dress shirts, and we challenge you to count the number of mustaches that make it on camera. But jest aside, it’s fun to think of how the advent of this chip affected the world. This post is just the second installment of our Retrotechtacular series (here’s the inaugural post). We haven’t seen any old movies come in from readers yet. What are you waiting for? Digitize that footage because we want to see it! Of course it doesn’t have to be your own movies, so anything you come across that covers decades-old tech is fair game. Brits didn’t lose their proper diction in the war. So, no. If you think about where the term “pixel” comes from, they’re actually doing it right – pixel is short for “picture element”. Impressive performance, I’ve seen modern PCs which are far more sluggish than this looks in the video. Sometimes I wish I was 20 years younger! Now please everyone invest all your money in enron and rid of all your apple and google stock! And it connects easily to my Acorn Econet network! That was actually surprisingly informative. Are the podules still available? Wait, did I say that out loud?